As the recruiting world's focus shifts from 2019 to 2020, next year's top recruit in the state is truly a wanted man. The best running back in the country headlines the American-Statesman’s initial 2020 Fabulous 55. Galena Park North Shore’s Zachary Evans helped his program capture the Class 6A Division I state title last year as a junior. He’s the unquestioned prize of the 2020 recruiting cycle inside the Lone Star State. The 6-foot, 213-pound five-star prospect holds 39 offers from the country’s best programs. 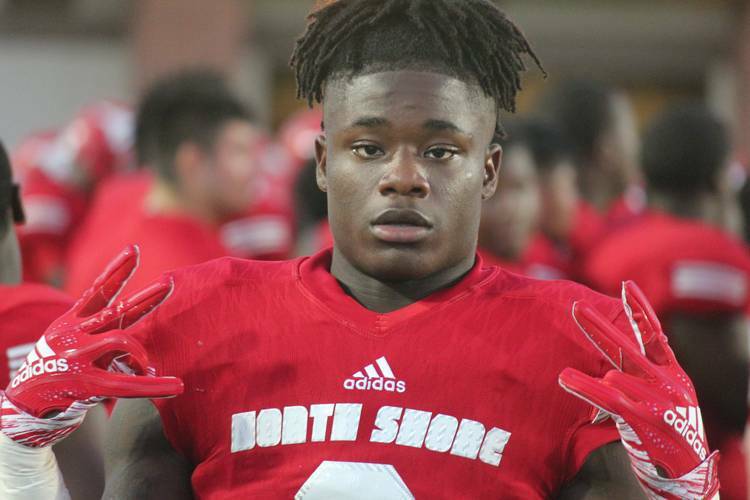 Evans arrived on the recruiting scene as a hot-shot sophomore splitting the carries at North Shore in 2017. He finished the year with 1,483 yards and 27 touchdowns on just 184 carries. He then posted a laser-timed 4.51 40-yard dash at The Opening regional in Houston in February of his sophomore year at nearly 200 pounds. The numbers matched the tape. Evans passed every test. Checked every box. Collected an offer from all the big schools. He then lived up to the hype as a junior with nearly 2,000 yards rushing and 29 touchdowns. He averaged more than 10 yards per carry and was named the MaxPreps national junior player of the year. None of this matters to Evans, of course. A cool, calm and collected teenager, he takes all the compliments and accolades in the same stride he takes to score touchdowns. There’s an aura of quiet confidence when he walks onto the field or into an interview. It’s like he knows what we all think we know: He’s pretty darned good at football and possesses all the tools to be special. Texas, Texas A&M and every SEC team is after him. It’s easier to list the top programs that haven’t offered than it is to list his offers. Evans is big. He’s fast. And he puts in the work. The theme of teamwork and winning is important to Evans. He plays for the best high school program in the state and wants to continue winning in college. Most recruits mention playing time or the coaching staff when listing the important factors in their recruitment. Evans wants an offensive line. Eleven offensive linemen are on the Fab 55, more than any other position. Houston Clear Creek tackle Chad Lindberg is the top-ranked offensive lineman at No. 7, and Texas commit Logan Parr is No. 14. Duncanville quarterback Ja’Quinden Jackson is the state’s second-ranked prospect. He’s listed as an athlete because it’s unclear whether he’ll remain a quarterback or move to wide receiver or even defense in college. He’s a good enough player to start at all three spots in college. He nearly led Duncanville to an upset of North Shore in the state title game. Wide receiver Demond Demas, cornerback Dwight McGlothern and wide receiver Troy Omeire round out the top five, respectfully. Demas is a state champion long jumper committed to Texas A&M. McGlothern is a long, rangy cornerback with the size to also play safety, and Omeire is a physical freak of nature with massive potential. Texas commit Hudson Card is the second-ranked quarterback in the state at No. 17 overall, trailing only Malik Hornsby of Fort Bend Marshall. Texas offensive line commit Jake Majors is ranked 27th. Texas A&M holds commitments from six players on the list. The Austin area is represented by Card, defensive linemen Princely Umanmielen and Alfred Collins, and wide receiver Collin Sullivan.